The following text is the statement of Archbishop Emeritus Desmond Tutu, published by Haaretz. The past weeks have witnessed unprecedented action by members of civil society across the world against the injustice of Israel’s disproportionately brutal response to the firing of missiles from Palestine. If you add together all the people who gathered over the past weekend to demand justice in Israel and Palestine – in Cape Town, Washington, D.C., New York, New Delhi, London, Dublin and Sydney, and all the other cities – this was arguably the largest active outcry by citizens around a single cause ever in the history of the world. A quarter of a century ago, I participated in some well-attended demonstrations against apartheid. I never imagined we’d see demonstrations of that size again, but last Saturday’s turnout in Cape Town was as big if not bigger. Participants included young and old, Muslims, Christians, Jews, Hindus, Buddhists, agnostics, atheists, blacks, whites, reds and greens … as one would expect from a vibrant, tolerant, multicultural nation. Earlier in the week, I called for the suspension of Israel from the International Union of Architects, which was meeting in South Africa. I appealed to Israeli sisters and brothers present at the conference to actively disassociate themselves and their profession from the design and construction of infrastructure related to perpetuating injustice, including the separation barrier, the security terminals and checkpoints, and the settlements built on occupied Palestinian land. “I implore you to take this message home: Please turn the tide against violence and hatred by joining the nonviolent movement for justice for all people of the region,” I said. Over the past few weeks, more than 1.6 million people across the world have signed onto this movement by joining an Avaaz campaign calling on corporations profiting from the Israeli occupation and/or implicated in the abuse and repression of Palestinians to pull out. The campaign specifically targets Dutch pension fund ABP; Barclays Bank; security systems supplier G4S; French transport company Veolia; computer company Hewlett-Packard; and bulldozer supplier Caterpillar. Last month, 17 EU governments urged their citizens to avoid doing business in or investing in illegal Israeli settlements. We have also recently witnessed the withdrawal by Dutch pension fund PGGM of tens of millions of euros from Israeli banks; the divestment from G4S by the Bill and Melinda Gates Foundation; and the U.S. Presbyterian Church divested an estimated $21 million from HP, Motorola Solutions and Caterpillar. It is a movement that is gathering pace. Violence begets violence and hatred, that only begets more violence and hatred. We South Africans know about violence and hatred. We understand the pain of being the polecat of the world; when it seems nobody understands or is even willing to listen to our perspective. It is where we come from. We also know the benefits that dialogue between our leaders eventually brought us; when organizations labeled “terrorist” were unbanned and their leaders, including Nelson Mandela, were released from imprisonment, banishment and exile. We know that when our leaders began to speak to each other, the rationale for the violence that had wracked our society dissipated and disappeared. Acts of terrorism perpetrated after the talks began – such as attacks on a church and a pub – were almost universally condemned, and the party held responsible snubbed at the ballot box. The exhilaration that followed our voting together for the first time was not the preserve of black South Africans alone. The real triumph of our peaceful settlement was that all felt included. And later, when we unveiled a constitution so tolerant, compassionate and inclusive that it would make God proud, we all felt liberated. Of course, it helped that we had a cadre of extraordinary leaders. But what ultimately forced these leaders together around the negotiating table was the cocktail of persuasive, nonviolent tools that had been developed to isolate South Africa, economically, academically, culturally and psychologically. At a certain point – the tipping point – the then-government realized that the cost of attempting to preserve apartheid outweighed the benefits. The withdrawal of trade with South Africa by multinational corporations with a conscience in the 1980s was ultimately one of the key levers that brought the apartheid state – bloodlessly – to its knees. Those corporations understood that by contributing to South Africa’s economy, they were contributing to the retention of an unjust status quo. Those who continue to do business with Israel, who contribute to a sense of “normalcy” in Israeli society, are doing the people of Israel and Palestine a disservice. They are contributing to the perpetuation of a profoundly unjust status quo. Those who contribute to Israel’s temporary isolation are saying that Israelis and Palestinians are equally entitled to dignity and peace. Ultimately, events in Gaza over the past month or so are going to test who believes in the worth of human beings. It is becoming more and more clear that politicians and diplomats are failing to come up with answers, and that responsibility for brokering a sustainable solution to the crisis in the Holy Land rests with civil society and the people of Israel and Palestine themselves. Besides the recent devastation of Gaza, decent human beings everywhere – including many in Israel – are profoundly disturbed by the daily violations of human dignity and freedom of movement Palestinians are subjected to at checkpoints and roadblocks. And Israel’s policies of illegal occupation and the construction of buffer-zone settlements on occupied land compound the difficulty of achieving an agreementsettlement in the future that is acceptable for all. The State of Israel is behaving as if there is no tomorrow. Its people will not live the peaceful and secure lives they crave – and are entitled to – as long as their leaders perpetuate conditions that sustain the conflict. I have condemned those in Palestine responsible for firing missiles and rockets at Israel. They are fanning the flames of hatred. I am opposed to all manifestations of violence. But we must be very clear that the people of Palestine have every right to struggle for their dignity and freedom. It is a struggle that has the support of many around the world. No human-made problems are intractable when humans put their heads together with the earnest desire to overcome them. No peace is impossible when people are determined to achieve it. Peace requires the people of Israel and Palestine to recognize the human being in themselves and each other; to understand their interdependence. Missiles, bombs and crude invective are not part of the solution. There is no military solution. The solution is more likely to come from that nonviolent toolbox we developed in South Africa in the 1980s, to persuade the government of the necessity of altering its policies. The reason these tools – boycott, sanctions and divestment – ultimately proved effective was because they had a critical mass of support, both inside and outside the country. The kind of support we have witnessed across the world in recent weeks, in respect of Palestine. My plea to the people of Israel is to see beyond the moment, to see beyond the anger at feeling perpetually under siege, to see a world in which Israel and Palestine can coexist – a world in which mutual dignity and respect reign. It requires a mind-set shift. A mind-set shift that recognizes that attempting to perpetuate the current status quo is to damn future generations to violence and insecurity. A mind-set shift that stops regarding legitimate criticism of a state’s policies as an attack on Judaism. A mind-set shift that begins at home and ripples out across communities and nations and regions – to the Diaspora scattered across the world we share. The only world we share. People united in pursuit of a righteous cause are unstoppable. God does not interfere in the affairs of people, hoping we will grow and learn through resolving our difficulties and differences ourselves. But God is not asleep. The Jewish scriptures tell us that God is biased on the side of the weak, the dispossessed, the widow, the orphan, the alien who set slaves free on an exodus to a Promised Land. It was the prophet Amos who said we should let righteousness flow like a river. Goodness prevails in the end. The pursuit of freedom for the people of Palestine from humiliation and persecution by the policies of Israel is a righteous cause. It is a cause that the people of Israel should support. 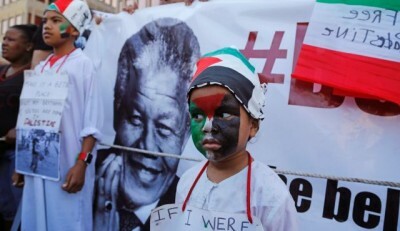 Nelson Mandela famously said that South Africans would not feel free until Palestinians were free. He might have added that the liberation of Palestine will liberate Israel, too.